After Rudy’s history making first 0 hog review, I felt like I needed to share a barbecue experience I had lately that was (spoiler alert) equally terrible. I arrived after work this particular Monday at the North Hills Raleigh Renaissance – a hotel I had never stayed at before. As I had a fair amount of stuff I needed to get done before some meetings the next day, I decided to just get some takeout and eat in my room. I was pleased to find a barbecue joint just around the corner from the hotel, so clearly, that was my choice for dinner. Walking in, I started to get a little skittish, as there was a large placard advertising wine (WTF?). I should’ve known then and there to turn around. But the restaurant was spacious and comfortable looking, putting me a bit at ease. The cafeteria line made me a little nervous, but I ignored it because I’ve had great meals in similarly set up restaurants. As I like to do when trying new restaurants, I opted for a combo plate in order to try several different types of meat. At The Q Shack, you order cafeteria-line style and your meat/sides are spooned onto your plate (or my to go box) from the line, so it’s hard to know how long it’s been sitting out. However, I was excited when my cut of brisket was carved in front of me from the full brisket that was kept warm in a warmer oven. All went well with my order, as everything looked great. When I got to my room, I eagerly took out my to go box and silverware and forked a nice portion of pork. This is where the problems started. The pork was terrible. It literally tasted like it had been sitting under a heat lamp for days. It was dry, and instead of a lack of flavor that I usually associate with bad barbecue, there was a bad flavor. Honestly, I once tried a McRib and I think it tasted better. I applied some of the sauce that was given to me on the side, and while that helped, it only moved the pork from awful to almost tolerable. Honestly, I should have stopped the meal then and there, but I thought to myself, “surely the brisket can’t be worse.” Well, turns out it can be just as bad. Had I not seen it sliced before my eyes, I would’ve thought I was eating Oscar Meyer lunch meat. The brisket was rubbery and tasted like a bad pot roast. Somehow I stomached a second bite, but it was just as bad as the first. Being a glutton for punishment, I moved on to the sausage. The sausage, fortunately, was far and away the best meat in that it was edible. Don’t get me wrong – it was still bad – but at least there was some flavor there. It was rubbery and over-cooked, but I feel like it would have been OK had it been cooked properly. The sides were average, which means they were the best part of the meal. The fried okra was fine, though nothing special, and the collards were decent. The hushpuppies were actually pretty good. Basically, the sides are what prevented me from having to go out and get a second meal after the catastrophe that was the meat. I didn’t take any photos of my meal, but no one would want to see it anyway. Honestly, I’m just glad I survived. Rudy: I heard a saying once that, “You can call a horse a duck all you want, but at the end of the day, it’s still a horse”, which I think applies to Red Rock BBQ. They can call it BBQ and brisket all they want, but what this place served was neither. I recently went on vacation to Arizona with my in-laws, and knowing I loved barbecue, they looked online to see what was the best place where we were going. Monk: I haven’t put this to the test yet but I would guess that my in-laws would be very accommodating for my barbecue habits. Very nice. Speedy: …And you better believe it will be a prerequisite should there ever be a Mrs. Speedy. Rudy: The gesture was extremely nice, but I knew something was amiss as soon as we showed up. Walking up to the entrance, the only smoke smell that was around was the smell of something burning badly, not of wood smoking. Most restaurants decorate their walls to represent the types of foods that they serve or where they are located, but Red Rocks BBQ only had a Guinness Beer poster. Rudy: Not exactly what you would expect from a barbecue place located in Arizona…should have been my 2nd warning. But I knew I was in serious trouble when I ordered the brisket platter and asked for it to be the ‘moist cut’ and the waiter gave me a confused look. Anywhere that pretends to sell brisket should know the different cuts and know what I was asking for. When the brisket arrived, it looked like chopped beef and tasted like unseasoned pot roast. There was no smoke ring, no crust, and no flavor. This was not brisket and this was no barbecue. They had several different types of sauce, but even they couldn’t make this “brisket” edible. Monk: From the looks of your photo below, it definitely looks like you’ve got some roast beef there, not brisket. 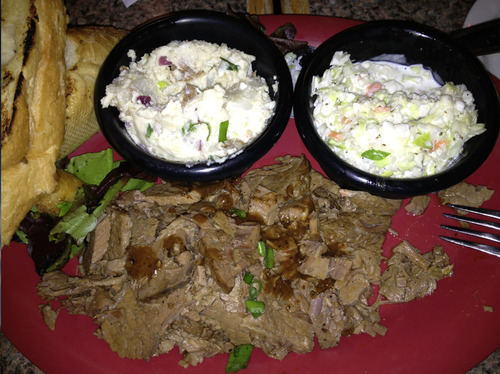 Rudy: For sides, I got coleslaw, which was mayo based (Speedy’s favorite) and potato salad. Both of these tasted like they were generic store bought sides. Nothing to write home about, but still better than the main course. Monk: If this place was as egregiously bad as you describe (and I have no reason to believe otherwise) then this would have just put me in a bad mood. Rudy: Again, my in-laws were trying to be nice and found me barbecue, so the hardest part was saying something nice or not spitting it out when they were asking me what I thought. While I love barbecue and like trying it all over the country as well, this experience may keep me from trying barbecue at too many places outside of the traditional locations. It was far and away the worst barbecue I’ve ever had, if you can even call it that. Speedy: I will say that I’ve had barbecue in Arizona one time – back in Phoenix in 2007. I don’t recall the name of the place, and while it wasn’t anything to brag about, it wasn’t this bad. Rudy, I think it’s your duty, nay, your calling to continue tasting barbecue wherever life may lead you.